My hubby thinks that I am obsessed with flip flops. Looking at these pictures, I can see where he might get that, but I do have to defend myself. We live in Florida. Flip flops are pretty much the only thing I wear besides running shoes, even in winter! I may own one or two pairs of closed toe shoes (besides boots that is), I'd have to check on that. I'm not even sure because they are only worn during winter. So in my defense, I've gotten great deals on ALL my flops and I wear them daily. However, even flip flops start taking up space in the closet when you have quite a few of them. 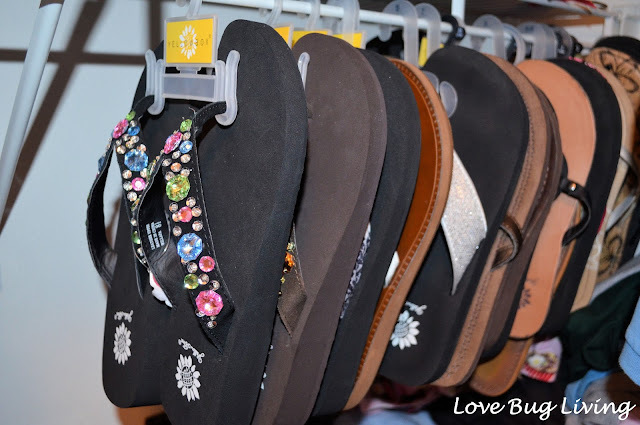 I needed a better way to organize my flip flops when I wasn't wearing them. Luckily, many of the flip flops I buy come with these little hangers that are used to display them. Even the cheap, rubber flops at Old Navy come on their own little hanger. The hangers may not work if you have a large bar for your clothes, but they are perfect for the wire closet organizers. I have a little area in the corner of wasted space where clothes are too long to hang, but it is perfect to fit my flip flops on their hangers. Even if you don't have the wire closet organizers, you can still use these handy little hangers. Hang a few pairs of flip flops on a plastic hanger and then hang it in your closet. 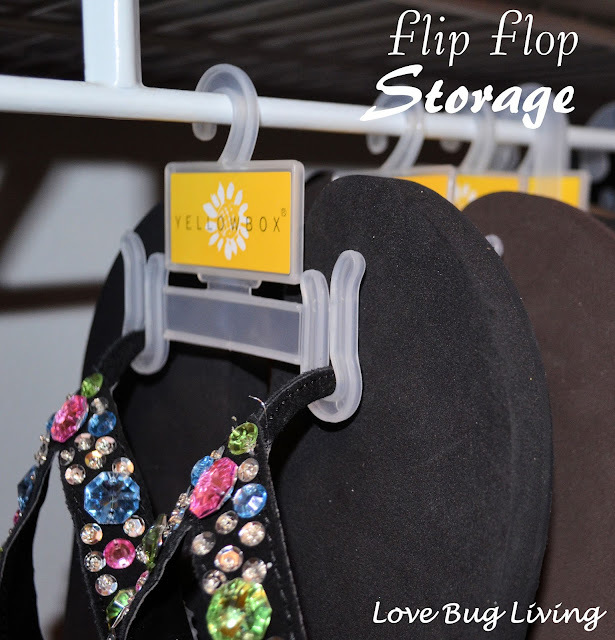 Hanging your flops keeps them from getting flattened by other shoes on the bottom of your closet, especially if you have the cute ones with the jewels on them. You can also see which flops you have, making it easier to pick the perfect pair. In my opinion, you just can't have too many cute flip flops!